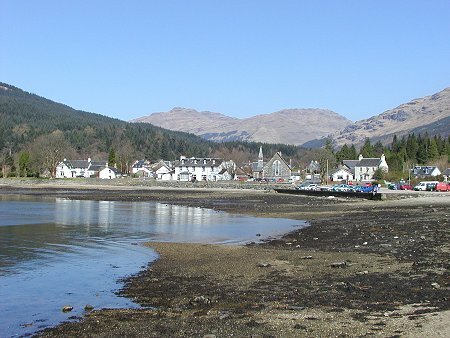 Lochgoilhead sits at the northern end of Loch Goil. This is the steep-sided sea loch that branches off Loch Long as it makes its way from the Clyde to its terminus under the shadow of the Arrochar Alps. Today it takes a little effort to get to Lochgoilhead. 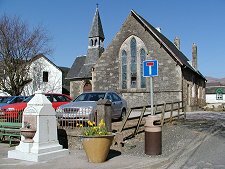 The village sits at the southern end of a "Y" shaped network of single track roads that lead north to the A83 at the Rest and Be Thankful pass and, via Hell's Glen, to the main road skirting Loch Fyne opposite Inveraray. 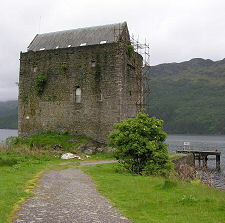 The first settlement on Loch Goil was probably on its west side, near Carrick Castle. This is about five miles along a minor road south of Lochgoilhead. The castle was originally built in the 1200s, though the ruins visible today date back to a tower house built in the 1400s and burned down during an attack in 1685. When we last visited the castle appeared to be undergoing renovation that had ceased some time before. For an understanding of why Lochgoilhead developed where it is, you need to start by thinking differently about getting around Scotland. 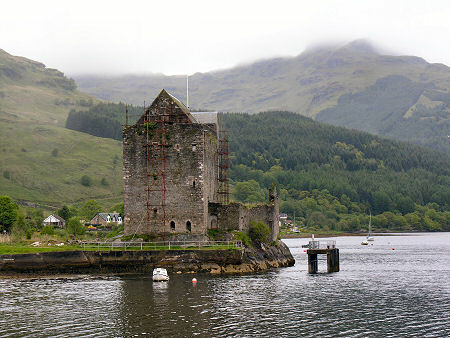 Although tracks existed by 1750, it was the coming of steamers to the Clyde estuary that really caused a settlement to grow around the existing church at the head of the loch. 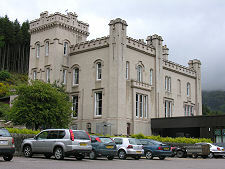 By the 1840s regular steamer services had led to the building of a series of holiday homes here. The summer steamer services still operated as recently as 1946, but since then access to the village has depended almost entirely on its roads. The main village has at its centre the old church shown on this page, or had until mid 2002: we've been told that since this image was taken the church has been demolished. 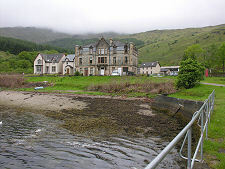 Also overlooking the harbour is the Lochgoilhead Hotel and the village shops. Lochgoilhead still has on offer the Lochgoilhead and Kilmorich Parish Church, a T-shaped building. The church you see today was built in the 1700s, but probably incorporates much of an earlier Church of the Three Holy Brethren built in 1379. 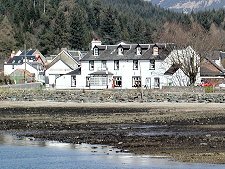 Recent years have seen considerable growth in the village, with the coming of a caravan and camping site, an outdoor centre, and a leisure centre and holiday village, as well as the Drimsynie House Hotel. 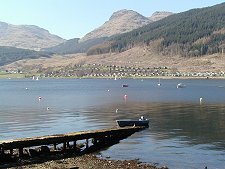 For many, what really makes Lochgoilhead attractive is not so much the village itself, but more the presence of the loch surrounded by imposing mountains. 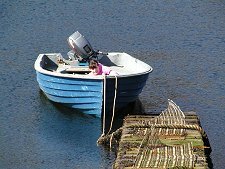 Though not far in distance from Scotland's central belt, it could be in another world, and it makes an ideal destination for those wanting an easily accessible, if sometimes very popular, taste of what the Highlands of Scotland have to offer.